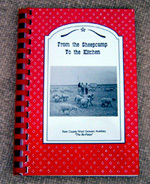 HISTORY OF KERN COUNTY WOOL GROWERS AUXILIARY " From the Sheepcamp To The Kitchen speciality cookbook. THE Bo-Peeps" ... We were organized in the early spring of 1958 to widen the use of the products of the sheep industry; promote friendship and better public relations for the entire industry and be of assistance to the Kern County Branch of the California Wool Growers Association. We are still doing that job today as well as taking on new challenges. We are very proud of our rich heritage and welcome the opportuity to promote the sheep and Sheepmen that feed and clothe a nation! We are one if the oldest undustries in the U.S. at 200 + years old. Our own Kern County Wool Growers Association is over 130 years old --- the oldest AG Association in California. Today, there area approximately 200,000 head of sheep in Kern Couty that annually produce 17.5 million pounds of lamb and well over 2 million pounds of wool! "The Bo-Peeps" have grown to nearly 600 strong. Our membership is active and thriving as witnessed by this Cookbook. Each year we keep very busy with "The Sheepman's Picnic", Kern County Fair, "Make It Yourself With Wool" competition, political concerns and philanthropic work to our community. We are very excited to present this written and pictorial history of our culture and industry through good cooking. Many of the home tested receipes contained herein are truly heirloom that you will find nowhere else. Enjoy! Pandora Perry ... President ... Kern Co. Wood Growers Association... "The BoPeeps"
What a history Bunco brings through this wonderful opportunity to share the story through the speciality cookbook of the Kern County Bo-Peeps. The above gives the background and I would like to share some of the wonderful things this book offers. I think every household should own this History and Cookbook. I am excited to offer the Bunco Enthusiasts this incrediable cookbook. These are truly some of the greatest recipes of time. To my knowledge this is one of a kind. The pages are filled with tips such as: Fat Facts, Calculating Percent Fat , "Heart Healthy" Recipe Substitutions", Food Labeling Definitions, Sodium ( Low Sodium Seasoning Sugestions chart ) Basic Guidelines for Losing Weight, Substitutions for a missing ingredient, and Microwave Hints. This book will be the Bunco enthusiats favorite. Full of educational pages, recipes, and hints. A wonderful must have cookbook. This cookbook is a perfect gift for Holidays, Weddings, Anniversaries and Birthdays.